Climate Common Sense: Australia a Shag on a rock! SO much for Australia winning global respect for imposing a carbon tax on its resentful citizens. At the climate change confab in Durban last week, Australian delegates reportedly tried to make a statement about our world-leading tax and were rejected. They had to wait until day two. The world has moved on and Australia sits like a shag on a rock, risking $100 billion on a gesture hardly anyone noticed. As Angelina Jolie, Brad Pitt (both above), Bono (below) and Al Gore (right) jet towards Durban to mingle with 15,000 climate delegates, the truth is that the world financial crisis has spoiled their party. Newly prudent nations, including the world's biggest greenhouse gas emitters, have no intention of following the kamikaze lead of Australia, which produces just 1 per cent of global emissions. Everyone but Australia has figured out we no longer can afford the luxury of empty gestures. And the latest batch of leaked climate scientist aimless, dubbed Climategate 2.0, confirm suspicions of something fishy about the global warming gravy train. The most damning conclusion from Climategate 2.0 must be that the scientific consensus is a hoax. The emails show eminent climate scientists conspiring to have PhDs stripped from sceptics, to have journal editors fired for publishing papers that contradict predictions of imminent apocalypse, and colluding with the media to slant coverage. This wasn't science. It was politics. But we don't need leaked emails to see the nature of climate politics in Australia. Take Adelaide geologist Ian Plimer, demonised by climate alarmists since the publication of his best-selling book Heaven and Earth. In his new guide for students, How to Get Expelled from School, Plimer asks: "If the science of human-induced global warming is so strong then why is it necessary for the climate industry to engage in fraud, exaggeration, obfuscation, personal attacks, spin and the demonising of dissent?" He mocks attempts by the academic establishment to marginalise him. "I've been banned from speaking at two Australian universities, yet I've been a full professor for 27 years. "This is really a totalitarian system." Exhibit A is coastal engineer Doug Lord, former chair of the national committee of coastal engineers. AMID exaggerated predictions that sea levels would rise by 75m, Lord made the career-ending mistake of actually measuring the sea level and trying to publish the results. This caused him to be "let go" from his government job and have peer-reviewed scientific papers pulled at the last minute from a conference in Shanghai last year, from a conference in Perth in September and from a journal this year. Not only that, but he was banned by his then bosses at the NSW environment department from representing Engineers Australia at a 2009 parliamentary inquiry into managing climate change. The irony is that he is not even a sceptic. "I believe in the climate-change science," he says, "but I see the need for the real data to be out there." Revolutionary concept. With colleague Phil Watson, Lord examined 110-year tide records from Fort Denison in Sydney Harbour, Fremantle in Western Australia, Auckland Harbour in New Zealand, and Pilot Station, Newcastle. They found the sea level was rising at less than 1mm a year, contrary to previous estimates of 6mm a year. In 2009, Watson published the results, putting the lie to Penny Wong's claims sea level rises would wipe out beaches and coastline. 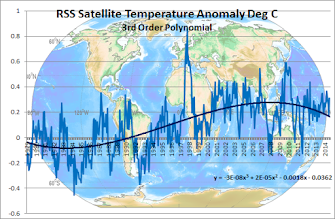 The analysis reveals a consistent trend of weak deceleration at each of these gauge sites throughout Australasia over the period from 1940 to 2000, he wrote in the Journal of Climate Research. The NSW environment department responded to media reports by claiming Watson had been "misrepresented". But Lord and Watson weren't making trouble. They kept looking at the data, "trying to see if there was acceleration", Lord says. "We could find no discernible acceleration." This was an inconvenient truth to governments busy beefing up climate risk assessments. The Federal Government predicted a sea level rise of 1.1m by 2100. NSW came up with 0.9m. But Lord's data showed they had exaggerated the rise by 1000 per cent. He predicts a sea level rise of no more than 90mm by 2100. LAST year, Lord and Watson were banned from presenting three papers at the International Conference on Coastal Engineering in Shanghai. "I was told (the Government) wouldn't support the three papers because they weren't consistent with the policy that was being developed". By this stage, Lord had lost his job, after a departmental "restructure". Nevertheless, he and Watson wrote another paper, which was peer-reviewed and approved for publication in the journal of Australian Civil Engineering Transactions. In September, just before publication, the paper was pulled. As was paper the two men were to present at the Coasts and Ports Conference in Perth. "Hundreds of hours go into putting together these papers," Lord says. "You put out your best assessments and if people see you did something wrong they tell you. If people don't allow you to put it out there you learn nothing." Attempts to censor science, and silence an honest expert like Doug Lord, reinforce our suspicions that the climate change industry is a scam. 1. There is nothing unusual about current temps (so what's the issue??? [there is NO hockey stick]). 2. Co2 has only been shown to be a result of temp changes (800 year lag! ), NOT a cause. Exactly. CO2's solubility in (sea)water is inversely proportional to temperature. A very large proportion of the planet's CO2 is dissolved in the oceans. The thermal inertia of the oceans is immense so there's a very long (~800 years) lag between temperature changes and CO2 absorption/expulsion by the oceans. We can see it as a simple natural cause-and-effect relationship. So why can't the "experts" who are getting paid $$$$ in research grants see it? Oh, right. If they acknowledged that there isn't really an impending catastrophe, they wouldn't get paid. CO2 absorption in water is dynamic as while it dissolves it forms carbonic acid H2CO3 which is inherently unstable and breaks down immediately. So there is a continuous cycle of solution and breakdown and it is not stored as some of the warmists claim.Because of this immediate breakdown scientists doubted the existence of carbonic acid in nature for a long time but found that it can exist but only in the complete ABSENCE of water which is obviously a problem in the oceans. unfairly doubted for so long? The carbonation leading to the lovely bubbles in our champagne and soda water is usually attributed to carbonic acid. However, this is not entirely accurate. It is actually carbon dioxide (CO2) that was formed during fermentation or forced into the beverage. A mere 0.003&percnt; of the dissolved gas is present in the form of carbonic acid (H2CO3). According to the textbooks, pure carbonic acid does not exist because it is extremely unstable. This has since been revealed to be a mistake. In recent years, various research groups have been able to isolate and characterize carbonic acid as a pure compound. Its stability has been proven in both the solid and gas phases, a result that could not be properly explained for a long time. What causes the discrepancy with earlier observations? Innsbruck researchers working with Klaus R. Liedl, Erwin Mayer and Andreas Hallbrucker have now revealed the secret. By performing some theoretical calculations, they found out, under which conditions carbonic acid is stable, and why this stability went unrecognized for so long. The result obtained by Liedl and his colleagues is both amazing and simple: water plays the crucial role! Absolutely water-free carbonic acid is very stable. Liedl calculated a half-life of 180,000 years for it. "However, carbonic acid decomposes immediately if it comes in contact with water. A single water molecule is enough to speed up the decomposition of a molecule of carbonic acid a billion times." Baron... I have my "2 points." But I'm a bit confused still, despite all you've said here, about carbonic acid + Co2 and oceans. Does my Point 2 stand? And what about the dynamics of the observed 800 year Co2 lag / release occur [in response to increased temps]? 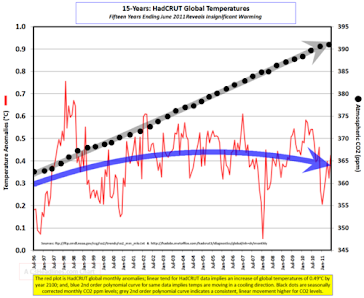 The time lag between rising CO2 and rising temperatures has been clearly documented by palaentologists and was one of the many things Gore got wrong in his inconvenient movie. I agree with your point. "There is ABSOLUTELY NO EMPIRICAL EVIDENCE (or any evidence of any sort) that CO2 leads to an increase in climate temperatures." Yes, agw nonsense, even the warmists (now) agree on the 800 year lag (BUT, previous ipcc reports, and Algore in his movie, had claimed falsely that Co2 was directly responsible for the warming). In any event, I'm waiting for Baron to weigh in again -- is there ANY evidence of any sort that Co2 causes climate warming? I've been looking for more info on interaction between the oceans and carbon dioxide. It's hard to find the facts in amongst the screeching of the Warmists and it's a complex subject. However the basic fact remains that CO2 (like other gases) is soluble in seawater and cold water holds more of it than warm water does. My uni chemistry days were 50 years ago now so I am not an expert and I agree that the CO2 solubility cycle is complex. CO2 is soluble as you say and is continually forming acid radicals and then disassociating. I note that a lot of elements in sea water affect pH and not just CO2. However you must remember that it is CO2 and anything it does must be bad. For Contrapundit CO2 is a greenhouse gas and must have some effect on temperature. However putting today's not unusual temperatures in a historical context with the 1930's and the MWP I would believe that empirically the effect is not large. Yes, CO2 is bad. Eventually Juliar will realise that we all exhale this horrible noxious pollutant which makes all plant life grow, and will rightly tax us for sinfully breathing. For Contrapundit, there's certainly scientific reason to believe that CO2 does indeed act to trap heat in the atmosphere. However there's very little correlation between CO2 levels and global temperature, except that temperature changes *precede* CO2 level changes. My understanding is that water vapour is the dominant greenhouse gas, but governments can't tax us for that so they never mention it. "Co2... must have some effect on temperature." Baron and Fred, there's no question that Co2 is a TRACE greenhouse gas. Is it strong enough to effect climate-scale temps in the context of the sun and etc etc? This is key. If we can say it isn't, then the global warming via Co2 theory is bunk, pure and simple. Mainly, is there any EVIDENCE that it is strong enough. I don't think so, but I'm not sure yet, so I'm asking if anyone knows more. I thought of an analogy. Imagine a high school auditorium in a cold winter mountain town. Open all the many big auditorium doors, and let the freezing air in. Also, plug in a little space heater somewhere. (That is Co2) It heats, but it doesn't effect the temp in the auditorium by even an iota. It is overwhelmed by the masses of cold air that come from outside. "To be sure, man’s emissions of carbon dioxide must have some impact. The question of importance, however, is how much. A generally accepted answer is that a doubling of carbon dioxide in the atmosphere ... would perturb the energy balance of Earth about 2 percent, and this would produce about 2 degrees Fahrenheit warming in the absence of feedbacks. The observed warming over the past century, even if it were all due to increases in carbon dioxide, would not imply any greater warming." I have seen the program and it makes a lot of sense. One of the problems the skeptics have is they have a lot of theories as to why AGW is wrong whereas warmists have only one theory - CO2 causes warming. This can make the skeptics sound like citizens of Babel. Lindzen is great, but it's sort of hard to quickly figure exactly what he is saying. And even though he is an MIT skeptic, it's possible that he is wrong about certain things. Baron has a MAJOR MAJOR point. I see verbose 53 page skeptic rebuttals of agw nonsense. It's too much. KISS keep it simple, STICK TO THE 2 KEY POINTS: 1. current temps are not unusual, and 2. CO2 has been shown only to be a result (not a cause) of warming. I know you guys are not specialists who have spent hundreds of hours looking at just this point on CO2, but until I hear otherwise, from anyone, that there is **evidence** that trace gas CO2 is more than just a theoretical warming agent, that it actually can overpower the difficult to quantify (& variable) other factors (sun etc), I'll still maintain that CO2 in the relevant PPMs has no discernible warming effect on the climate. Of course, I'm looking for a more definitive confirmation. It's certain that the amount of CO2 not entering the atmosphere because of Juliar's Carbon Tax will have zero effect on the climate. Not now, not in 1,000 years time.